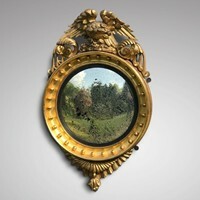 A 19th Century Gilt Convex Mirror. The frame with a concave inner and outer edge, surrounding a half round band, gathered to each quarter with formal leaves and rings. The convex plate held within an ebonized reeded slip. Height 22 1/2 inches, width 22 1/2 inches, depth 2 1/2 inches.